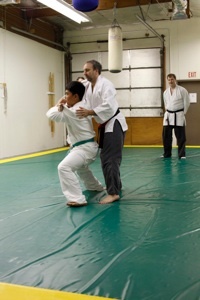 This course is an overview of the techniques taught in Danzan-Ryu Jujitsu. In addition to learning the basics of rolling and falling, stances, throws and holds, you'll learn about the history of Danzan-Ryu, dojo etiquette and safety. You should take this class if you want to know more about jujitsu and improve your physical conditioning. 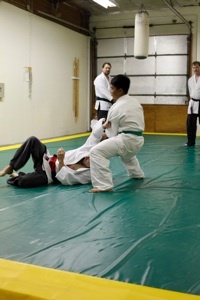 This course is a prerequisite to the Adult Jujitsu classes. 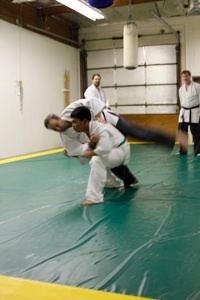 Introduction to Jujitsu is structured in eight independent one hour modules. Upon completion of all 8 modules, you have received the entire course. The course is offered as a 4 week program, 2 nights a week. Wear loose clothing that allows freedom of movement. A judo gi is not required for this course. Maintained by: webmaster@DanzanRyu.com, we welcome comments. Copyright © 2004 to 2012 by Kodai No Bushido, 3525 Ryder Street, Santa Clara, CA 95051 USA.